August 8, 2014 k3fitLeave a Comment on August 2014 Newsletter! This marks the final month of summer vacation for the kids and teachers out there! I hope everyone is having an amazing summer and making some great memories with family and friends. In the Fitness You Can Live With World a few exciting things have been happening. I am happy to announce that www.fitnessyoucanlivewith.com is now an official website. Yay! Now you can easily access all of my information as far as rates and services, recipes,contests etc. So please take advantage of all the useful info I try to get out to you to keep you on track or motivated to live a healthier life. Refer a friend or family member to the site and help spread the word of health and fitness. Check out my services, I do more than just personal training. I offer a wide range of nutritional services,educational consultations and group sessions. I will even come to your home and help you learn how to cook better food in the kitchen! Here is a great summer recipe to try out that uses a wide array of vegetables and tastes amazing on a hot August day! My own personal Gazpacho soup recipe. Give it a try and let me know how you like it…or love it! 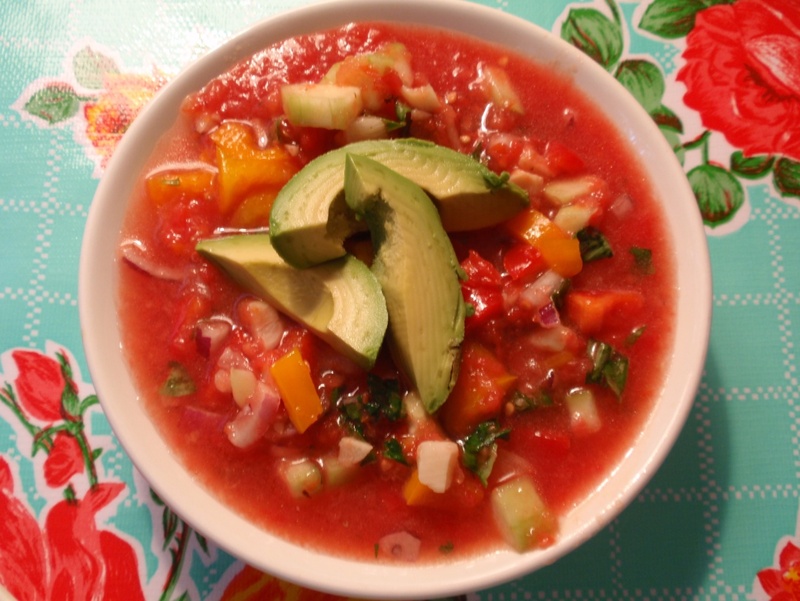 GAZPACHO SOUP IS A FUN REFRESHING SOUP TO HAVE IN THE SUMMER BECAUSE IT IS SERVED CHILLED AND LOADED WITH FRESH VEGETABLES. YOU CAN REALLY PUT IN ANY VEGGIES THAT YOU LIKE BUT HERE IS MY VERSION, you can use any amount of veggies you like. This amount will make a large batch with many servings. Add everything together, I season the soup with fresh black pepper, a little sea salt and ms. Dash fiesta lime or one of the other ms dash varieties add really nice flavor. The soup is great served with whole grain croutons on top as well as diced avocado. To get in some lean protein with your soup you can serve with a side salad topped with grilled chicken, fish or black beans, or grilled tofu as an option. Next Wacky Wednesday. Is Calorie Cutting Good?